I like to grow potatoes. Have you ever tried? I’ve found them to be the easiest, most low-stress, set-it-and-forget-it vege to grow and for that reason alone I will always have potatoes growing in my garden. Truly, potatoes are da bomb! The weather this weekend was so gorgeous I was able to get out and plant some stuff. Onions, garlic, broccoli – and potatoes! But there is a technique of sorts to planting potatoes that may not be obvious so I’m going to show you. It is super easy and will produce more potatoes than you would typically get if you just stuck the seed potatoes in the ground. Here goes. First, you need a deep pot or container in which to grow your potatoes. My raised vege garden is only 6″ tall and is nowhere near deep enough for lots of potatoes so I went out bought one of these Smart Pots. I’m OK admitting it isn’t the pretties of pretties but I have found it to be affordable, reuseable, perfect for growing my potatoes and easy to add an extra drip irrigation line for easy watering. 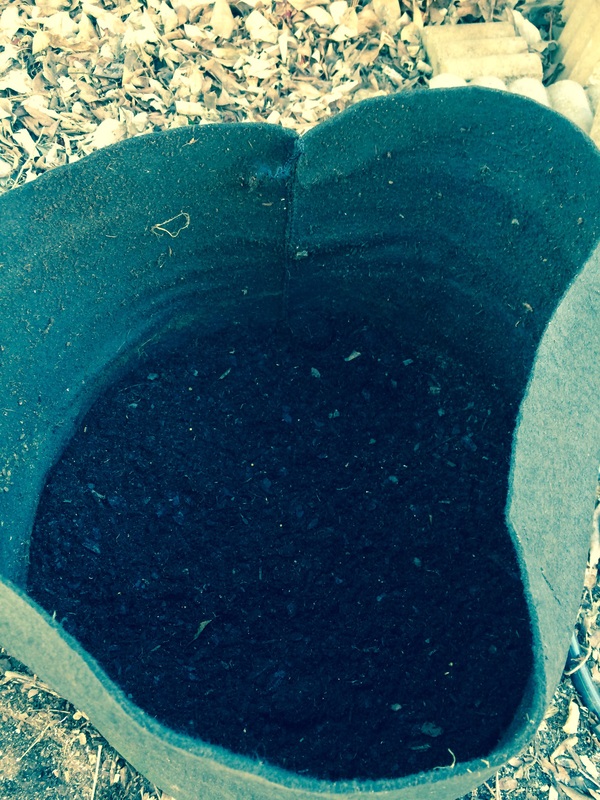 The sides and base are porous which allows water to drain well and for the air to get to the roots. Potatoes like water but don’t like to be soggy so having a well draining pot hooked up to drip irrigation made it all very automatic with no further intervention from me – perfect! I bought my seed potatoes from my favourite local nursery, Pike Family Nursery in Ballantyne. I love the people in there. So helpful and friendly. 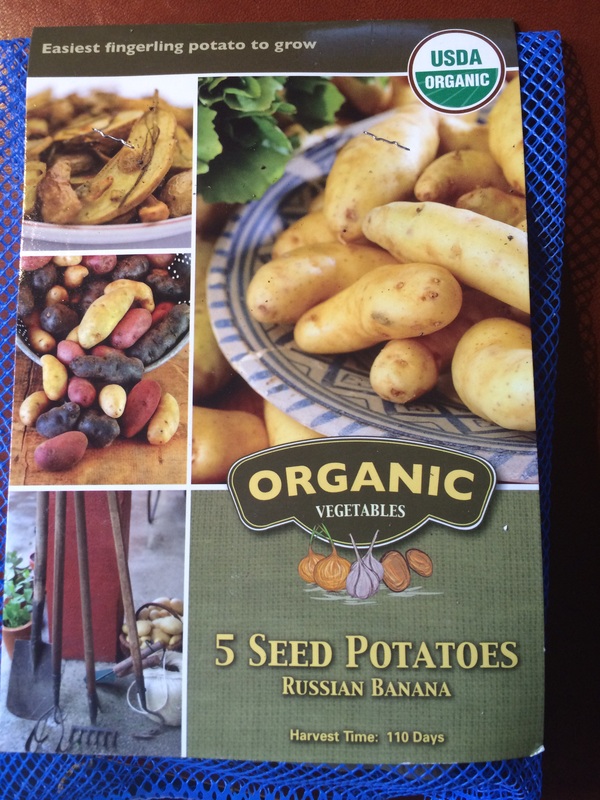 And they sell the organic seed potatoes I like. I had so much luck last year with this variety. 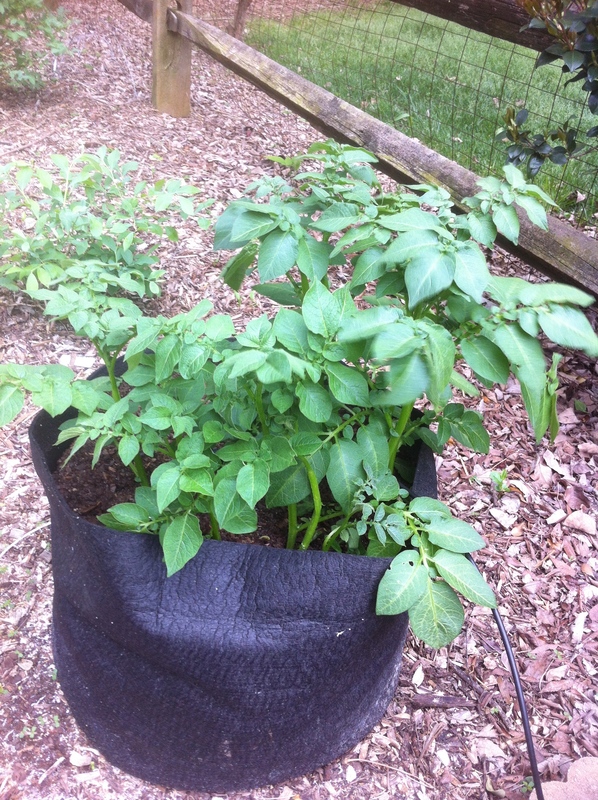 I planted just 3 of the seed potatoes in the Smart Pot and grew pounds of potatoes. They were so yummy roasted alongside roast chicken but would have been perfect for potato salad, too. Kids loved harvesting and eating them. Win-win-win all around. So I’m planting them again this year. This is what the seed potatoes look like. This is what the seed potatoes look like. See the shoots coming from the eyes? 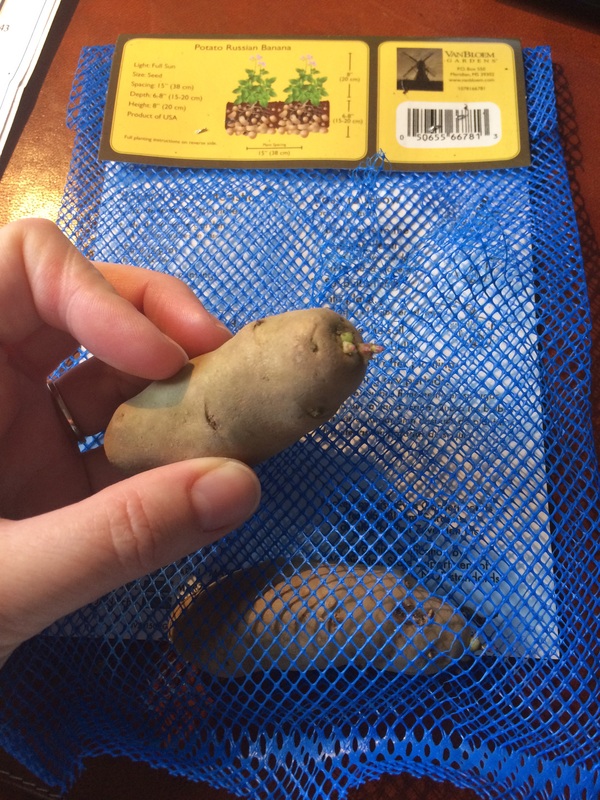 I could actually cut this one in half and make two plants if I wanted to – just make sure there are at least 2 eyes per potato piece when you plant. 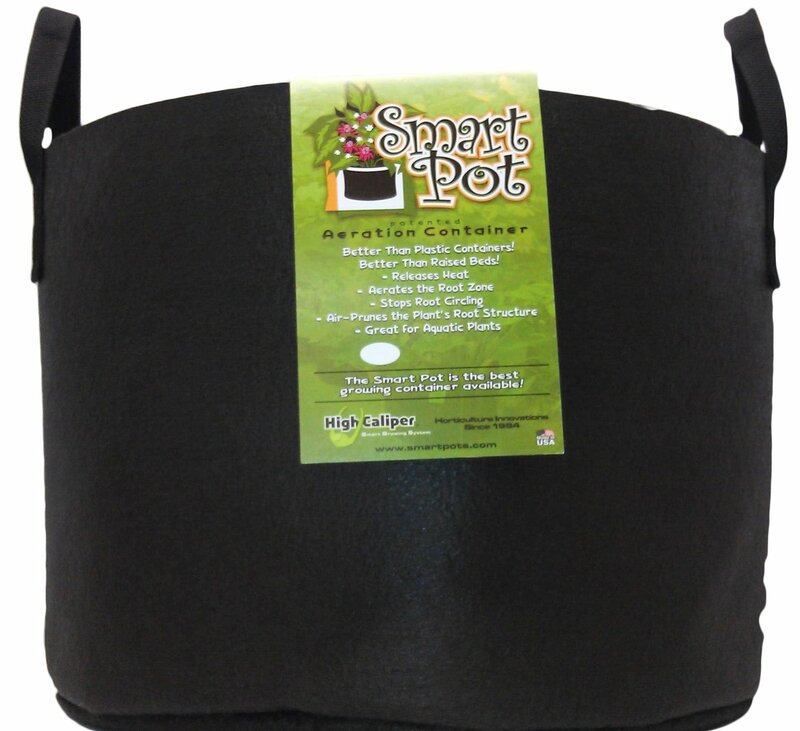 Next, take your Smart Pot and fill it about 1/3 full of soil. Then place your seed potatoes in a circle towards the outside, maybe 2″ in from the edge (you can cut them in half if you want so they go further), then cover them with more soil. Kinda mound it up a bit, and then water well – but not so it is soggy, although the Smart Pot wil drain away any excess so there is less of that to worry about here. Planted seed potatoes. See how the bag only has a few inches of soil in the bottom? Then after a week or two you’ll start to see green shoots appearing through the soil. Let them grow a bit more, and then cover those new green shoots with more soil, allowing just the top green leaves to poke out of the top. Then wait another week or so for the shoots to grow some more, then cover those new stems leaving just the top leaves poking out the top … and so on and so on until your pot is finally full. What you’ll find is that all those shoots you have buried will produce more potatoes, potatoes you would not have grown if you had just put the seed potato in the top of the filled Smart Pot. Clever, huh? Late spring your pot will start to look like this. By late summer you’ll be able to start harvesting. You don’t have to dig them all up at once, just take the ones you want to use right now and leave the others alone to keep growing/store underground for a little longer. They do fine just sitting there waiting for you to do something with them. I didn’t bother peeling them to eat as the peels were so thin and tender. We mainly ate them roasted after tossing in olive oil, salt and pepper. Cook at 400*F for 20-25mins or until golden brown and a little crispy on the outside and fluffy on the inside. 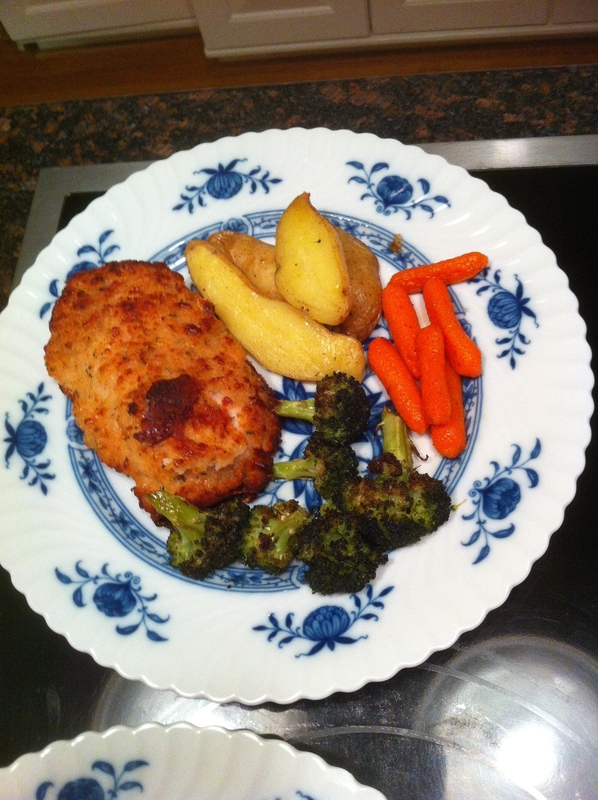 Chicken schnitzel dinner made with homegrown potatoes and carrots. Broccoli was roasted along with the other vege – yum! I’m already looking forward to more potatoes from my garden. Do you grow potatoes? Any tips you’d like to pass on? I didn’t have much luck with my potatoes this season. My own fault as my set and forget was a little extreme – I didn’t mold the soil over the new shoots as they grew. Will have much better crop next year! You don’t grow in containers, though, do you? Just in the ground? I have a feeling you have an amazingly awesome vege garden and don’t need to faff around with all this container stuff. Although I know your native soil is rubbish, hard clay like what we have over here (good for gum trees, lousy for much else), so maybe you do do raised beds? Would love to try taters in the ground one day but that will only happen if we move to Idaho or Ireland. Ha! So there was a reason I didn’t cash out on Amazon prior to reading this post. I added the pot to my order, and I am going to put it to good use. I have been pondering how to grow potatoes efficiently for many months now, maybe over a year. Initially, I reasoned I would find an old whiskey barrel until I discovered the impracticality of it–not easily moved, expensive… Voila! My solution has appeared, freeing my mind for another sustainable idea! Thanks so much for sharing your experience for others to learn from. Oh, yay! So glad that this looks like it will be a solution for you. Do you know what kind of potatoes you want to try? 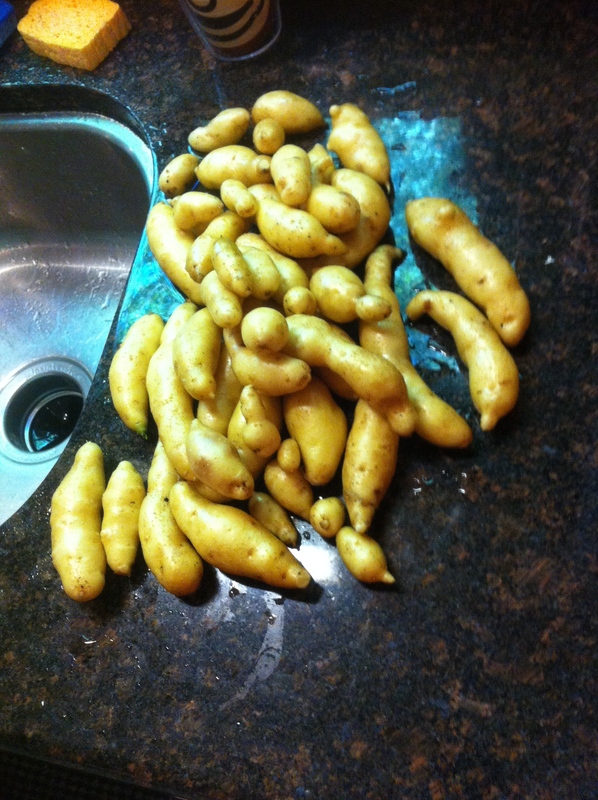 I’ve only ever grown the fingerling potatoes but am so curious to see how other varieties do. I hope you come back and tell me how your potatoes did once you get to harvest. Thanks for reading! There is nothing so pleasant as digging for potatoes right before cooking them. What size pot did you use? I’m thinking of getting two, so I can grow golds and reds, but I don’t want to grow more than we can eat. I’ve grown both varieties in the ground before, and they were scrumptious. I think mine is the middle size pot as it was a bit of an experiment at the time and I didn’t want to commit too much. It will take 3 seed potatoes. If I had my time over I would buy the largest pot so it could take 5 seed potatoes. Hope it works out for you! I hope you’ll get to try growing potatoes in a container like this. Just this morning I was looking at the potato vines going crazy and marvelling at how little care they need. So very easy!